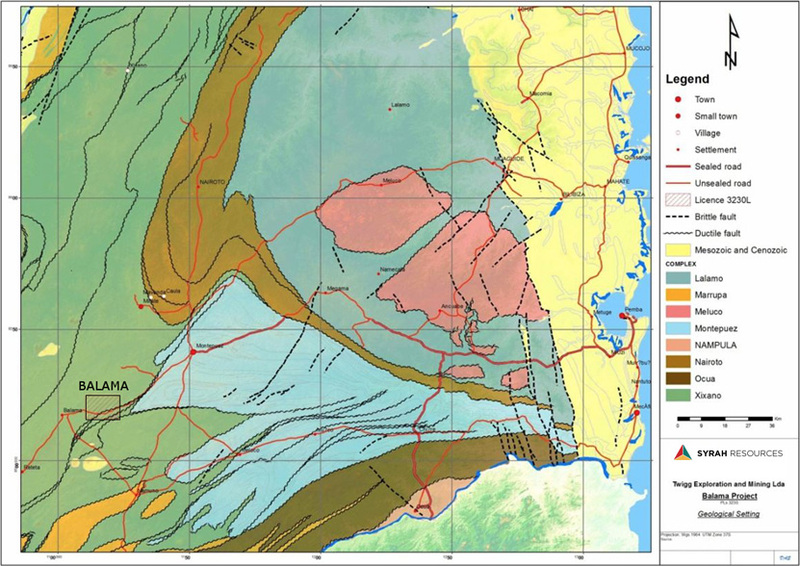 The geology of northern Mozambique is dominated by high-grade Mesoproterozoic (1600 to 1000 million years ago) and Neoproterozoic (1000 to 540 million years ago) aged metamorphic rocks of the Panafrican Mozambique Belt (a belt of rocks that were formed due to the collision of two plates during the formation of Gondwana). 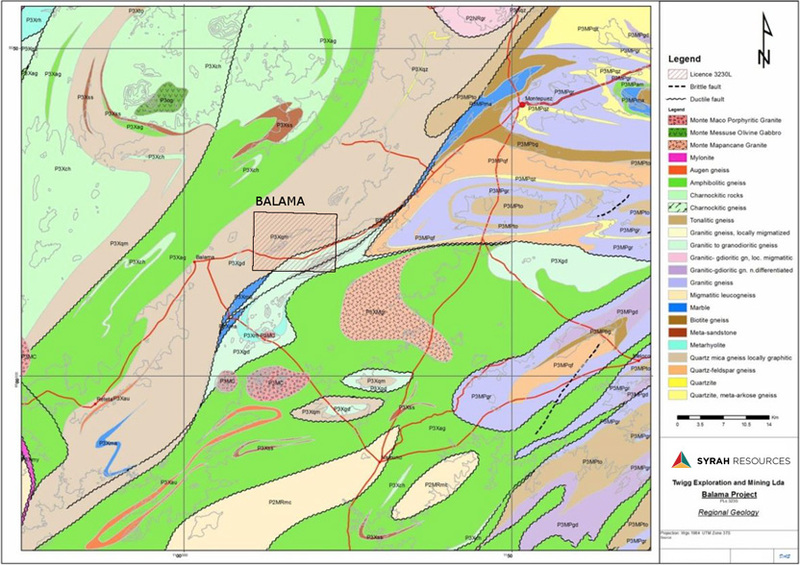 The Balama licence is entirely underlain by granulite and upper amphibolite facies orthogneisses (metamorphic rocks derived from igneous rocks) and paragneisses (metamorphic rocks derived from sedimentary rocks) of the Xixano Complex (Neoproterozoic age). The gneissic units of this complex trend north-northeast (NNE) over much of its extent and reach into southern Tanzania. This NNE trend is rotated to east-northeast (ENE) in the Balama area due to its proximity to the ENE trending Ocua Complex and Lurio Mobile Belt to the south (Regional Geology Map Link – 1st figure below). The Xixano Complex consists of a NNE trending synformal structure (basically a U shape) with a core of mafic orthogneisses surrounded and underlain by paragneisses consisting of micaceous gneiss and schist, quartz-feldspar gneiss, quartzite and marble. Graphitic gneiss and schist (locally enriched in vanadium) occur within the micaceous gneiss unit (P3Xqz in Local Geology Map – link to second map below). The micaceous paragneissic unit underlies most of the Balama area. The Xixano Complex represents a volcanic arc where marginal sedimentary basins formed adjacent. These basins would have been inshore basins that form immediately in front of the volcanic arc (a modern day analogue is the Indonesian archipelago). The paragneisses represent these sedimentary basins. A number of post tectonic intrusions are present to the south of the licence area. Pegmatites (intrusive rocks) and weakly deformed granites within the licence area may be of the same age. 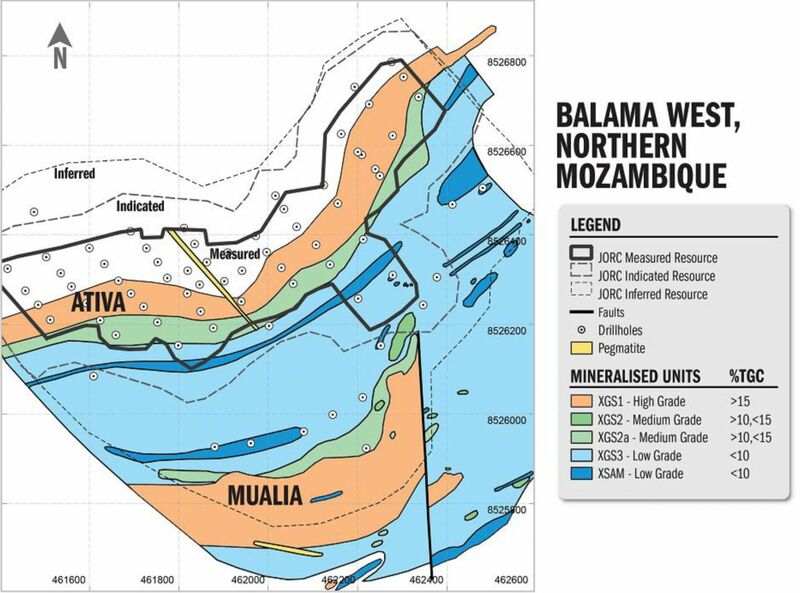 Two prospects, identified in 2011, have been the focus of exploration drilling and current developmental work, Balama East and Balama West, and are separated by a distance of approximately 3km. In Balama West there is a repetition of graphitic schists around a central core of lower grade graphitic psammite (XGS3). The main zones have been termed the Ativa and Mualia zones. These are defined mainly by the high grade XGS1 unit. At Balama East there is also a repetition of graphitic schist, however the central core is the XGS4 unit; which is not present at Balama West. The sequence here is bifurcated by a granitic intrusion and the mineralisation is seen to wrap around the edges. 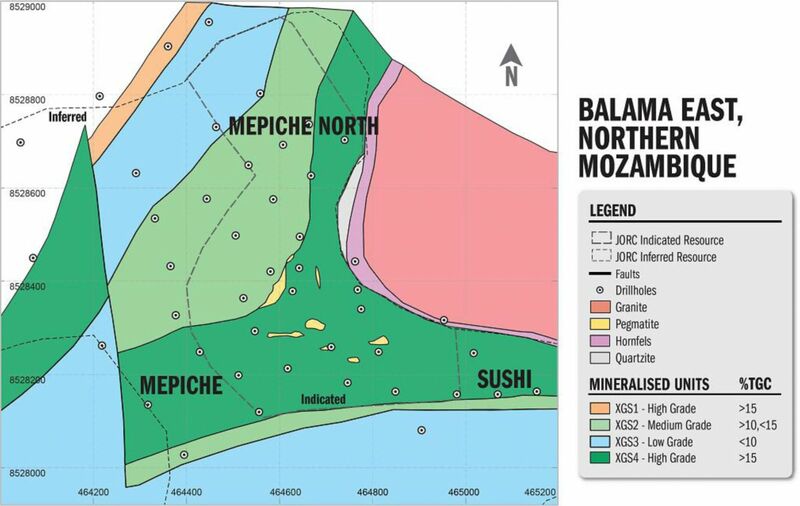 Here the zones of interest are the Mepiche, Mepiche North and Sushi zones. These zones are defined by the XGS4 and XGS2 units and constitute the highest grades and thickest mineralisation. The Sushi zone shows particularly coarse flake graphite development and will be an excellent source of Jumbo flake. The Balama deposits can be classified as a cross between Disseminated and Bedded style. Disseminated deposits are characteristically schists or gneisses with graphite dispersed throughout. The graphite forms as a result of the metamorphism (heat and pressure) of organic material within the rock. The graphite at Balama also shows a bedded character. However, in a Bedded style deposit the graphite precursor is coal. The Disseminated style deposits are largely much older than the oldest known coal deposits. In the case of Balama the precursor to the graphite is certainly biogenic kerogen basically organic/carbonaceous matter, formed from the deposition of vast quantities of plankton) and this is supported by the strong vanadium correlation and the “bedded” nature of the deposit. The origin of the vanadium can also be traced back to plankton. 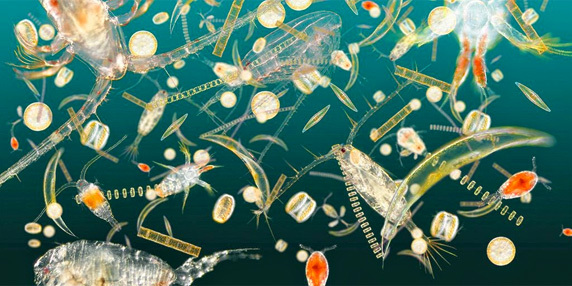 Plankton are rich in chlorophyll, which contain porphyrins. Porphyrins are crucial to photosynthesis, a process that plankton rely on to survive. These porphyrins are adept at adsorbing vanadium ions from sea water. Over time, and while the aquatic basin remained open, vanadium was accumulated by the plankton. Once the basin was closed to recirculating seawater and the plankton died, the vanadium becomes preserved under anoxic conditions (an absence or deficiency of oxygen). After deposition of the plankton and many millions of years of burial, metamorphism and deformation, the carbon and vanadium derived from the plankton was transformed into arguably the biggest deposit of graphite and one of the largest resources of vanadium.